How may frames could a rogue welder make in a shift? For how many shifts? Could be a lot of bikes. With out an official explanation from Tern we are still only guessing the scale of the problem. I suspect that this is the culprit. Is there a way to know if a full welding was done? by XRAY perhaps? Thanks for this vote of confidence. Also I wish to thank Adrian for joining in this discussion as his expertise is very welcome and helpful. A couple of new thoughts here: first of all, the gusset is really just an adapter to fit the down tube to the size of the hinge plate--a true gusset ought to have more diagonal room. Nevertheless, skipping welding the whole perimeter of the original tube creates two locus points in the formation of stress fractures where the welds jump off the tube perimeter, and loses the opportunity for an extra support weld across a very highly stressed zone. Also, I can plainly see the original tube shape and thickness in cross-section, on the tube side of this break, where the weld SHOULD have obliterated this line by melting the metal into the weld bead itself. The net result is a weld sitting on top of the tubing rather than welded INTO the tubing. In soldering this is called a cold solder joint. (I'm not sure what the proper term for this is in welding.) The effect is like gluing the joint together with epoxy rather than truly welding it together as a single unit of metal. I must conclude that regardless of the design deficiencies, the weld here is obviously bad, and that is to my untrained eyes, too. Such a weld would probably look great from the outside without being obvious to inspection. The only way to catch this would be that periodic X-rays or cross-sectional cuts would need to be performed on random bikes to ensure that the welds are being done to design standards. The good news is that proper TIG welding of aluminum is a skill easily trained into competent factory workers. The bad news is the possibility that literally thousands of these welds could have already passed inspection and be in use by cyclists on the roads today. Only Tern can reveal the extent of this from their records: how many bikes have been done by this or these workers? If this is just a small group, it can easily be handled in a limited recall. If this has gone on for years unnoticed, it will be a bit more painful to Tern. But I am sure they will do the right thing since there is no alternative for an ethical company. Lives are at stake here. BTW, had this been a steel bike, these welds might have held in spite of being "cold" due to steel's greater strength, but regardless of the material, no weld done this way will have the strength it could have had if done properly. Have any of you that have had a broken frame had a satisfactory outcome yet? Have Tern give you an answer as to waht caused the defective welds? Seems to have gone quiet again. When will Tern tell us how many frames they think are affected. I know it takes time but I would have thought their investigations would have give some answers by now. For now, I am riding with caution. Everytime i ride, i remember those who had their frames broken. Its a pity really, since i enjoy riding my Tern but the thought of me kissing the asphalt not knowing what happened is making me a paranoid. I am nowback with my Trek hybrid, forcing me to bike back home in the evening. The reason why i bought a tern bike is now defeated. I am hoping to receive an email that my frame is okay and that the manufacture was according to specs. Or even a message that i should stop riding until my frame is found to be not among the anomalous batch. I can understand how you feel. When you hear reports like this it will make you wary of the bike. It puts people off riding them and puts people off buying them. It is not doing Tern any good by taking so long over this issue. I understand they have to get their facts right, but I think the riders who have had their bikes fail should have had an proper explanation by now. How may Terns are now sitting in the corner because their owners are wary of riding them? Plus riders who have Terns need to know if their bike may be affected. finally the whole joint failed, and that is where the metal is brightest with no signs of rubbing. Any official word from Tern about these frame failures yet? still waiting too.. also still not confortable about riding my bike. Sadly! It would be really good if we have an official announcement from tern about this. Another month went by, the seasons pass and no answers. Just empty phrases every now and then. This is a joke, but still some are happy with that. One could get the impression the only test that tern runs is a field test and we are the guinea pigs. I am so keen and I predict: We will never get an answer with any substance. Very, very poor indeed. As a Link D8 customer, I feel very let down by Tern. Can I ask, for those with longer experience of Tern than myself, who have knowledge of previous failures, what are your comments? Do we need a more focused campaign to entice a response from Tern? #2 email between members is no longer allowed. I tried to email re-tern and got an error message. Not the changes anyone expected! I contacted Mr. Bickerton a few days back and he stated that the investigation is ongoing.....after 6+ months! I did not post anything in the past month hoping things would turn out properly, but this is just ridiculous....they seem to be taking advantage of everyones kindness. The first post on this topic was made by Lee on December 20, 2013. Now I understand that thorough investigations can take some time--coupled with the possibility that Tern is not only investigating the cause of the failures but re-engineering the product to solve the issue and then testing that as well. All of this can take a lot of time. I think we have to allow for the likelihood that this company is in good faith diligently working on this issue and allow them time to complete this action. Are we just naïvely being duped as we excuse their apparent lack of action? That remains to be seen, but at this point the time line still hasn't reached the point that we can conclude this--not in my opinion. Not to put a deadline on this, but from my perspective six months seems like a fair and reasonable length of time for a very thorough investigation and resolution to be announced. Six months from December 20, 2013 will be on June 20, 2014. Let's make it the next day, the Summer Solstice, June 21, 2014. That is 5 1/2 weeks in the future from today. Enough time to wrap up a very thorough investigation and announce its conclusions to loyal patrons who have waited half a year in good faith. Even if final solutions have not been verified at that point, I think it would be a good point to release the gist of the information which has been gathered to date and at least reassure us that there WILL be a resolution, not a stonewall. Again, I can not establish a deadline, but this is a recommendation. Beyond six months does seem unreasonable even to patient patrons. Let's be patient just a little bit longer. I think Tern will not let us down. 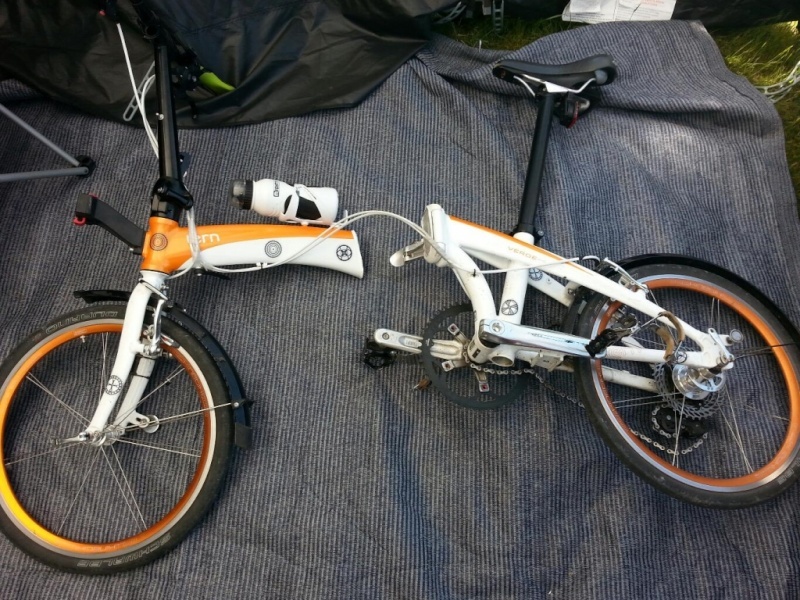 The 2013 USA recall information can be found at http://www.cpsc.gov/en/Recalls/2013/Stile-Products-Recalls-Tern-Folding-Bicycles/#remedy . It states there were two frame failures, which instigated the recall. There are 6 in the UK and nothing.....this does not add up. 1. Comtact the CPSC in the USA at (800) 638-2772. I called them, they only accept information from customers affected by faulty products. 3. I do not believe this forum to be ideal to discuss problems. Moving forward please use http://www.bikeforums.net/folding-bikes/948076-tern-frame-failure-thread.html it is free public forum with no connection to any bike company. And I just received a return e-mail from another forum member. I do not buy into the conspiracy theory, but I did get an error message when I tried to email to Bikerrrguy. Error message was: "Access Denied". First off let me apologize for my improper tone earlier. I was prejudicial against Josh because of some nonsense 10+ yrs ago. Josh I apologize! I must admit Keith is awesome. He is very level headed and non-prejudicial! I am back to work making tests and running my biz. I doubt there is any prejudice from you. It's strictly business on your part, and your business is selling Downtube bikes. I just bought my link D8 on saturday 10 may 2014, and I'm numb right know. I don't know what to do. I must return the bike and get a refund. As I searched before buying the bike for info, reviews etc, I did see the first post of Lee Tibbets but without the 250+ replies, and I thought it's just a false alarm post or fake post. Omg , 6 failures so far? Please advise , I have the frame number: AI11410348, I think it's a 2013 model. Is it from the faulty frame batch? I just bought my link D8 on saturday 10 may 2014, and I'm numb right now... Is it from the faulty frame batch? Well, it's not clear that there *is* a faulty frame "batch". The closest thing to a "cluster" is the observation that the problem frames have mostly (5, IIRC) been in the UK and one in Israel (?). There haven't been any new reports for a while now; of course, that doesn't preclude the existence of others but in the absence of any official information it may be a hopeful sign. There are thousands of these bikes on the road, and it doesn't appear that any more than a tiny percentage of them are involved. I wouldn't do anything rash. I have a Verge, and I'm feeling the bottom of the weld forward of the frame joint every time I fold the bike. It just takes a second, and I believe if there were a crack starting there I would feel evidence of it. It is evident from the images we've seen that the cracks were present at the lowest point long enough for the metal to corrode slightly. This makes it likely that the apparent sudden failure of these welds was actually the culmination of a process that began some time previously, and so identification of an early failure should in theory be possible. This is the best I can do under the circumstances... I would welcome a better plan. Of course, if you can return the bike and feel it's the best thing to do, go for it. But I think it's not necessary to panic just yet. Hope this makes sense. I just bought my link D8 on saturday 10 may 2014, and I'm numb right know. I don't know what to do. I must return the bike and get a refund. As I searched before buying the bike for info, reviews etc, I did see the first post of Lee Tibbets but without the 250+ replies, and I thought it's just a false alarm post or fake post. Omg , 6 failures so far? Please advise , I have the frame number: AI11410348, I think it's a 2013 model. Is it from the faulty frame batch? Any Help is more than welcome, Thank you. This entire thread is about your dilemma. If any of us could answer your question, the problem would be solved. I don't want to tell you to return a perfectly good and safe bike which you could have enjoyed trouble-free for years; I also don't want to tell you to ride a bike which might suddenly fall apart and cause serious injury. What to do? Tern probably already knows the answer to your question. They have examined the returned bikes microscopically and done failure tests on bikes off their assembly lines. We await their verdict. Meanwhile they are scaring their customers the longer they delay. Why delay longer? Perhaps it is much more complex than we imagine. It could be bad news and so they are checking their facts and rechecking their facts just to be sure. Next month on June 21, 2014--the solstice--will be a day past six months since this question began on this thread. I think half a year is a reasonable delay for a very thorough examination of such a problem. [If this were the space shuttle, the complexity of that obviously required more than six months to solve the problem after Challenger, but this is not THAT complex.] Can you delay until then? Consult your bike shop where you bought it. Tell them you are awaiting the official word from Tern on this model as to its safety. Tell them you can wait until then before you ride it (can you?). But you want to be able to exchange it for another model if the word comes down against this one. If they say you can not return it after this long a wait, tell them that you will then have no choice but to exchange it now, while it is under the immediate warranty of purchase period (assuming you have such a policy there in Greece). I would let them decide it for you: if you can return it later, hold onto it; if not, return it now. If you have to keep it until it actually fails, without any recall, you may have to risk injury, and may only get a new frame and have to pay for all the hardware to be transfered to the new frame, which is a lot of work for the guy at the bike shop. I wish I could be more reassuring. This just emphasizes how important it is that Tern get this resolved ASAP--so people can just go back to buying and enjoying their bikes without any reservations or concerns. Best of luck and let us know what happens for you. I just bought my link D8 on saturday 10 may 2014, and I'm numb right know. I don't know what to do. I must return the bike and get a refund. As I searched before buying the bike for info, reviews etc, I did see the first post of Lee Tibbets but without the 250+ replies, and I thought it's just a false alarm post or fake post.. This really does annoy me! I put the post up to see if anyone else had the same problem. I think it's pretty unhelpful and misleading to potential customers to make the forum readable to members only as buyers should be able to make an informed choice(with or without signing up to the forum). Sure, I probably would have done the same if I saw that the post was a one off... but it's not...and the posts are hidden, which isn't right. It's like reading a headline from a newspaper but having to sign in to be able to see the article. I have a Verge, and I'm feeling the bottom of the weld forward of the frame joint every time I fold the bike. It just takes a second, and I believe if there were a crack starting there I would feel evidence of it. It is evident from the images we've seen that the cracks were present at the lowest point long enough for the metal to corrode slightly. This makes it likely that the apparent sudden failure of these welds was actually the culmination of a process that began some time previously, and so identification of an early failure should in theory be possible. just saying from my own personally experience with the bike, I cleaned and checked my bike regularly ( I like to look after my thing!) and I didn't see a crack. The images I posted does show a dulling of the metal, but I saw no crack developed. Maybe it was because the bike was painted black that the crack didn't show. It's also noted by another member (sorry, I cant remember who) that you should be able to feel that the frame isn't right when riding it, like a slight give...again, I didn't feel any such thing. 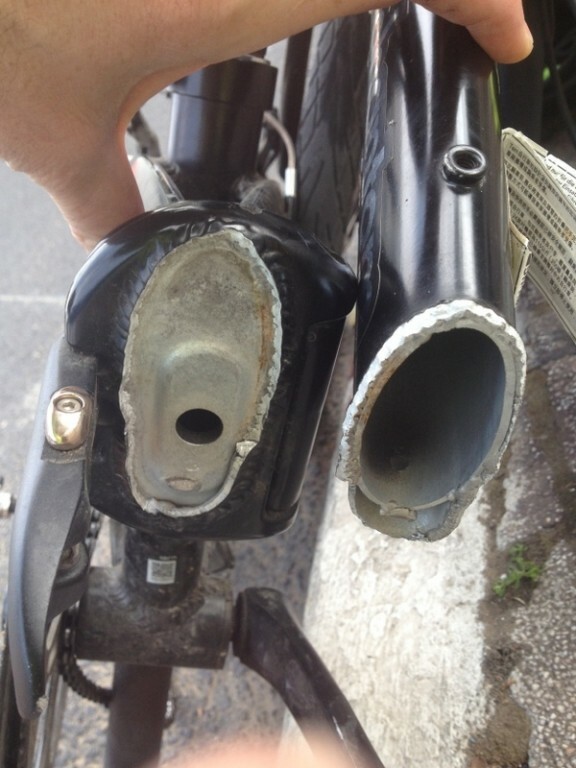 I'm not new to bikes so I know how a bike should feel... the Tern felt right.... right up until it broke in half!!! So, it's up to you whether you want to ride it. Like Steve says, many people love there Terns and have had no incident. I have and personally wouldn't buy another one. I'm wondering what the legal position is: Tern is continuing to sell the bikes. Does this mean, the problem has been identified and the new bikes should be safe? If so, why haven't we been told? If the problem hasn't been resolved, what is the legal position re selling bikes with a known problem? From a worried owner, reletant to ride his bike until we have some answers. Your first post is visible to unregistered users, right? You should be able to edit that post. Please edit your first post to include the following. "****Please note that you must register on the Tern web site to in order to view this entire thread. ****"
I would also suggest to that you add a summary of the frame breakages, injuries and the response from Tern to date so that even unregistered users will be able to read the important facts. just saying from my own personally experience with the bike, I cleaned and checked my bike regularly ( I like to look after my thing!) and I didn't see a crack. It's also noted by another member (sorry, I cant remember who) that you should be able to feel that the frame isn't right when riding it, like a slight give...again, I didn't feel any such thing. I'm not new to bikes so I know how a bike should feel... the Tern felt right.... right up until it broke in half!!! Lee, I'm not saying you (or any of the others whose frames cracked) were negligent. Why would you have been looking for that sort of problem? I do think that if such a crack were developing it would be possible to *feel* it with a finger-tip. Any roughness detected would be an indication to have a very close visual inspection. I have a lot of confidence in my fingers' ability to detect small things... maybe too much. Short of having a welded joint x-rayed, I can't think of any other inspection process that might be effective. On the other hand, I certainly don't feel that every frame should be condemned. As for the suggestion that the bike should "feel different" before the fracture, I am skeptical. Aluminum is a pretty stiff metal, so I suspect that the ride quality could be normal right up to the point of failure, or close enough as to make no difference. I had a crank fail on my Dahon and (probably because it was a constantly moving part and my foot was very close to it) I noticed "something" about the way it felt (the pedal shaft was precessing). When I inspected it (I thought it was a problem with a pedal), the crank had begun to bend and the crack was most of the way through. A frame crack probably wouldn't give that sort of sensory feedback. Based on frame cracks on both my old Dahons, though neither frame failed, I could not have told by the ride quality that something was amiss. On both those bikes it was visual inspection that found the problems. There haven't been any new reports for a while now; of course, that doesn't preclude the existence of others but in the absence of any official information it may be a hopeful sign. >Sigh< I spoke too soon.